CHARLESTON, W.Va. — When students and teachers walk into classrooms at the new Mary C. Snow West Side Elementary School in Charleston next month, the lights will automatically turn on — and flip off when they leave. Motion sensors in each classroom also will tell air-conditioning and ventilation systems when to kick into gear at the $14 million school. The 60,000-square-foot building, which opened on Tuesday, is being heralded as the "smartest" school in West Virginia, thanks to an integrated system designed and engineered by a St. Albans company, Mason & Barry. "With a smart building, it's all about energy, and it's all about safety," said Mike Martin, vice president of Mason & Barry's security division. "We integrate all these systems so they can talk to each other. This is the first school in West Virginia that's a total smart building." 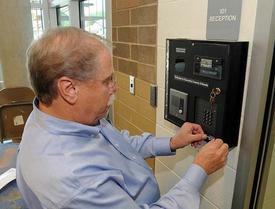 Clacy Williams of Mason & Barry Inc. places labels on a card reader/intercom system before entering the new West Side Elementary School in Charleston. Last week, workers were putting the finishing touches on the West Side Elementary's "Smart School" features — sensors, smoke detectors, fire alarms, heating and cooling units, proximity card readers, electronic door locks, lighting, surveillance cameras — and a large red button. Push the button, and all of the school's outside doors lock. "The technology is there to protect kids," said Clacy Williams, the former executive director of the state School Building Authority who now works for Mason & Barry. Smart buildings connect once-separate features such as heating, ventilation, air-conditioning, fire detection and suppression, security cameras and lighting into a centralized system that monitors those processes and reduces unnecessary energy use. The building continually adapts to changing conditions, ensuring safety and comfort for occupants. Additionally, a smart building energy management system decreases energy costs by about 35 percent. Duncan, Martin and Williams demonstrated the "building automation" system last week. 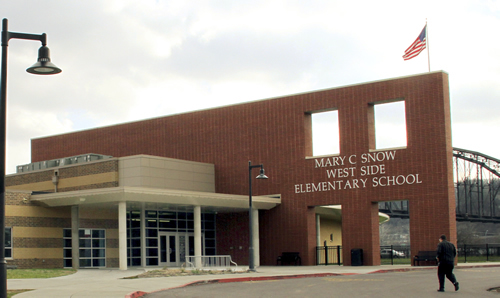 After typing in a password, they called up a computer screen that showed West Side Elementary's floor plan. They could see the temperature in every classroom, the cafeteria, kitchen, and even in the cooler and freezer.